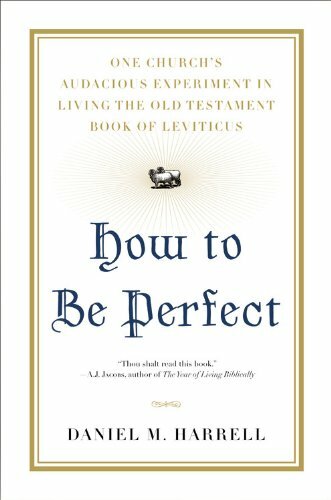 How To Be Perfect takes you on a journey through your soul by showing you Grace with the teachings of Leviticus. An insightful, witty and sometimes dry, bible-based non-fiction as told by Daniel Harrell, a minister for over 23 years and a group of his parishioners who try to live the Laws of Leviticus for one month. Levitican law is a hard subject to comprehend, there are 613 laws in the Torah of which 253 are still practiced today by Orthodox Jews. Harrell and his group try to live each day picking and choosing which laws they are able to practice and applying them to their everyday lives. Harrell shares each of their trials and tribulations as they try to do as the law states. I would have liked to have seen more emphasis on the laws and less on the cross-referencing between both the Old and New Testaments, which, if you have never read the bible, would leave a person confused and disconcerted. I don't recommend this book for everybody, however, faith-based Christians would find this book interesting and enjoyable. David M. Harrell and a group of 19 parishioners set out to live the Laws of Leviticus for one month. Using blogs, Facebook, weekly dinners and other networking venues, the group share with one another their thoughts and feelings about living the Law. Leviticus teaches how to live communally, love our neighbours, as well as, showing us how to live our lives clean, disease-free, keep the Sabbath and the penance you pay when you sin.